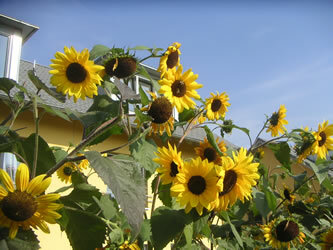 Sunflower oil has a very neutral taste and is very popular for cooking purposes. Of course, not all sunflowers are used for their oil only certain oil producing sunflowers. As a result, sunflower farmers interested in selling sunflower oil must be sure to plant the correct type of sunflowers in order to yield the sunflower oil. When it comes to oils, sunflower oil is one of the healthiest oils around, and it is light tasting, low in fat, and most importantly all natural. Amazingly, sunflower oil has more vitamin E than any of the other vegetable oils available not to mention it is low in saturated fats and combined of polyunsaturated and monounsaturated fats. Sunflower oil performs very well when frying and in all types of cooking and because of this sunflower oil is used worldwide by restaurants, chefs, and ordinary families who enjoy great tasting oil that is healthy. One wouldn’t think so, but sunflower oil is actually healthy and is especially beneficial because of this. Additionally, sunflower oil isn’t just sunflower oil as there are three types available. The types of sunflower oil you can buy include linoleic, high oleic, and NuSun. These oils are developed by sunflower farmers who use normal breeding techniques; however the different oils have varying levels of oleic that gives each oil special properties and uses. This non-transgenic vegetable oil is healthy and offers cooks and food manufacturers just what they need in cooking oil. Additionally, with three varieties of sunflower oil no matter what you are cooking or manufacturing there is sunflower oil that is perfect for the job. Sunflowers provide healthy snacks and oils and although they have been popular for a while sunflowers are gaining in popularity due to the healthy characteristics of the plant. If you want to stay healthy then eat sunflower seeds on a regular basis and cook with sunflower oil. You can find sunflower seeds for sale anywhere from a convenience store to your local supermarket. There are many options as well and you can choose in shell or shelled as well as a variety of flavors from natural to Cajun. The sunflower seeds are tasty, healthy, and just waiting to be eaten. Additionally, you can find sunflower oil for sale in most any supermarket so if you cook with oil often you should consider replacing your current oil with sunflower oil. You will be surprised at the health benefits and the fact that sunflower oil fries foods to perfection. Go ahead and give sunflower products a try, you surely won’t regret it.